The NCI Technology Transfer Center (TTC) excels in customer service! 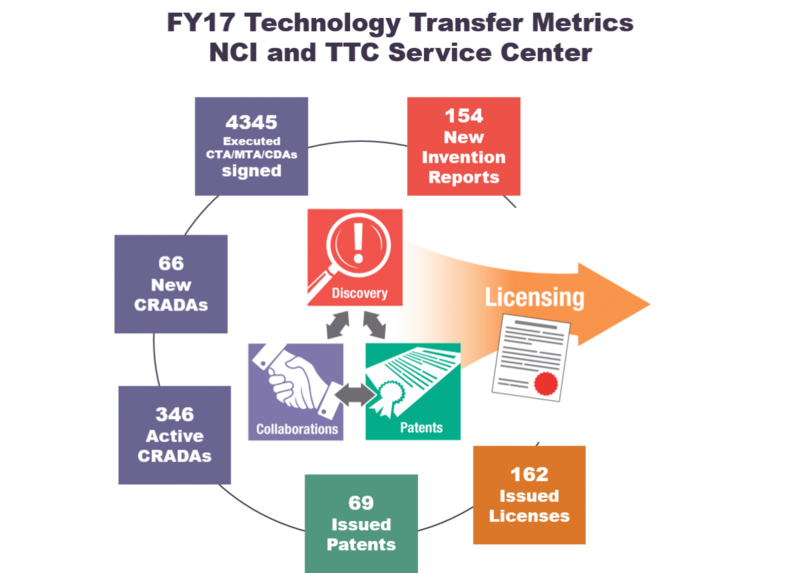 TTC facilitates partnerships between external organizations and the research laboratories of the NCI and nine other NIH institutes and centers. The TTC is comprised of professionals with diverse legal, scientific, and business/marketing expertise, and most have doctorate-level technical and/or legal training. Our team of technology transfer, invention development, and marketing specialists will apply their specialized training to help you in invention reporting, patenting, patent strategy, executing technology transfer agreements, translational development, and marketing. Our customers include pharma / biotech company representatives interested in solving a specific technical issue, tapping into world-class resources or expanding their business; investors (angels, venture capital, private equity, etc.) starting a new company or adding to the pipeline of portfolio companies; academics interested in finding a collaborator or research materials; non-profits interested in finding treatment options for patients or to develop NCI technologies; and NIH Investigators interested in patenting a discovery or in need of resources to develop a technology. Typical outcomes of partnerships with the NIH are the therapeutics, vaccines, diagnostics, medical devices and research tools that benefit patients worldwide. You can better understand and quantify the work we do and the value we provide with our metrics. Contact our Invention Development and Marketing Unit. We will connect you to the right resources.